Around a year ago, AMD graced us with the Ryzen APU family, bringing higher logical core counts and the Vega GPU architecture to the APU platform. Unlike the rather.. limited.. FM1/2/2+ platform family, the new generation ran on the AM4 platform, allowing anyone to choose between CPUs and APUs for their builds. What the new Ryzen platform also offered is a chipset-less option – A300. 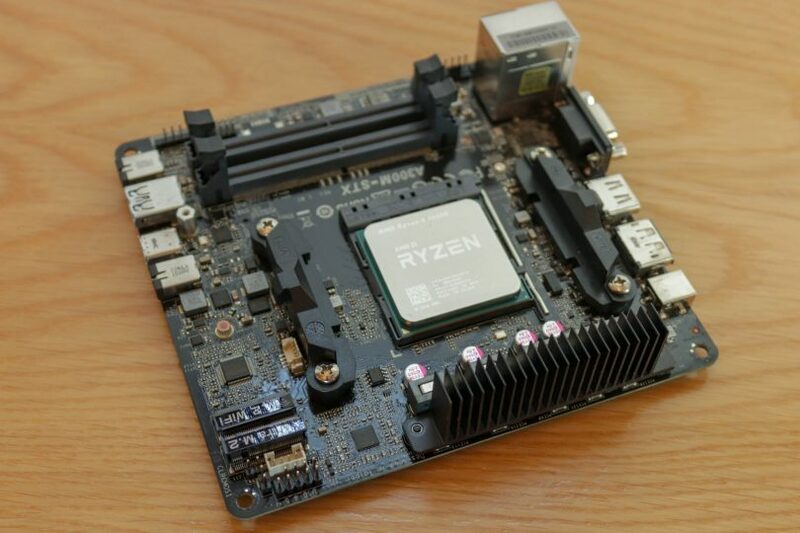 Because Ryzen integrates so many controllers and devices into the die, it is possible to create a motherboard with no chipset at all, much like the ill-fated AM1 platform. SATA, PCIe, RAM, and more fed straight from the CPU/APU to the requisite ports on the board. Nice! This does come with some limitation though. 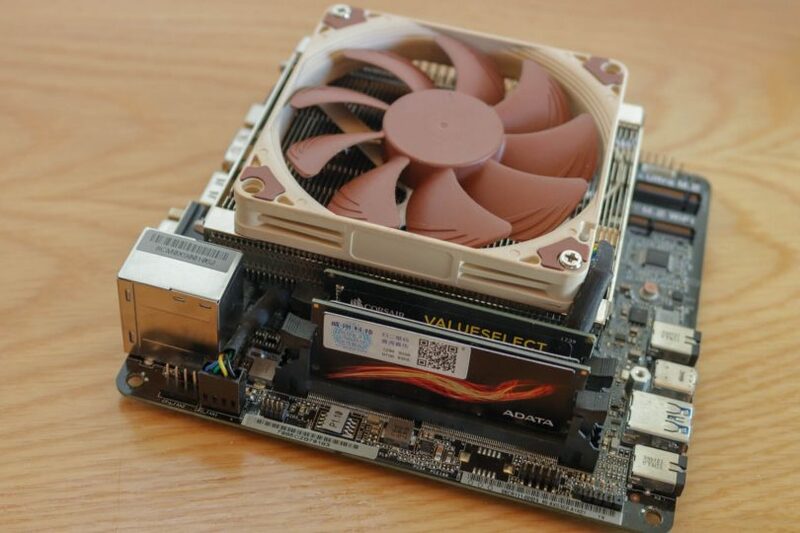 “A300” eschews multiplier overclocking, has a limit of 2 SATA ports, less PCIe and less USB3. Not much of a big deal with ultra-SFF systems though – there just isn’t room to use these. Well, except USB3. We could always use more USB ports. Coming in a box a LOT flashier than the H310 series DeskMini, the Ryzen core of this product is clear on the packaging, from the orange pinstriping to the Ryzen swoosh on the top. A definite upgrade from the business first aesthetic of the Intel version. In-Win is still the OEM for the DeskMini chassis – as seen on the SKU sticker. Apart from this, various info is available on the outside of the box. Most of which is token gestures to regulatory authorities. Nothing to see here, let’s move on. Opening the box, we are greeted with a quick start guide and a driver CD. ASRock, seriously. This system has no optical drive, no spot for one internally, and I’d argue 99% of systems are connected to the internet to download up-to-date drivers. This is just waste for most people at this point, a shame. The drivers on the CD could be 6-12 months old if the product sits on a retail shelf for long enough as well! The DeskMini A300 is very well protected. I’d like to see more use of cardboard instead of foam in packaging – whilst clear plastic film/bags are easy to recycle in residential waste streams, foam is not so. Cardboard, much better. Hiding under the cardboard here are the included accessories. A power lead for your region. An interesting inclusion, this cooler. 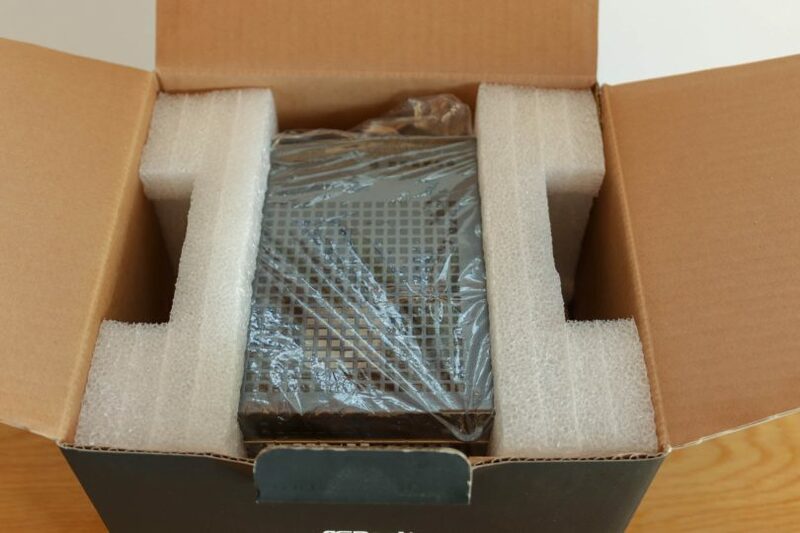 I’d argue this adds more waste to the packaging, as most users would purchase a retail pack for their APU, which would generally include a Wraith Stealth cooler. What I found during installation, though, is that the cooler compatibility in this system is limited, and not just in height. Without a Wraith Stealth cooler to hand, I cannot test physical compatibility. The cooler is definitely of a previous generation design, with no heatpipes, just a solid aluminium extrusion with pre-applied thermal paste. I’d honestly expect readers of SFF Network to avoid using this cooler, so I have not tested it in this review. Let’s open this well packaged machine and see what it has to offer us. 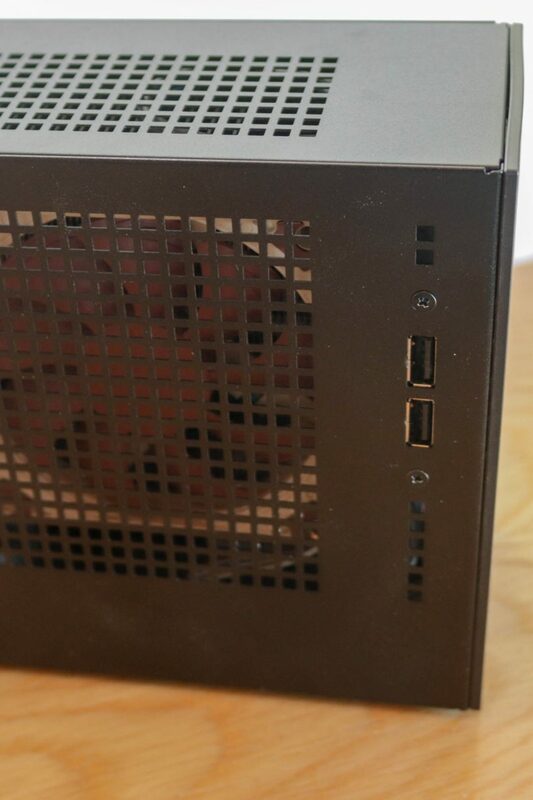 The case is identical to the recently reviewed H310 model, save for an HDMI sticker. The front panel ports are the usual DeskMini affair, being a microphone input, headphone output, USB3.1 Gen 1 Type-A and USB3.1 Gen 1 Type-C. Many users in the community argue that the front panel in plastic is a cheap copout. I’d agree, if the system didn’t cost the US$149 it does at time of writing. 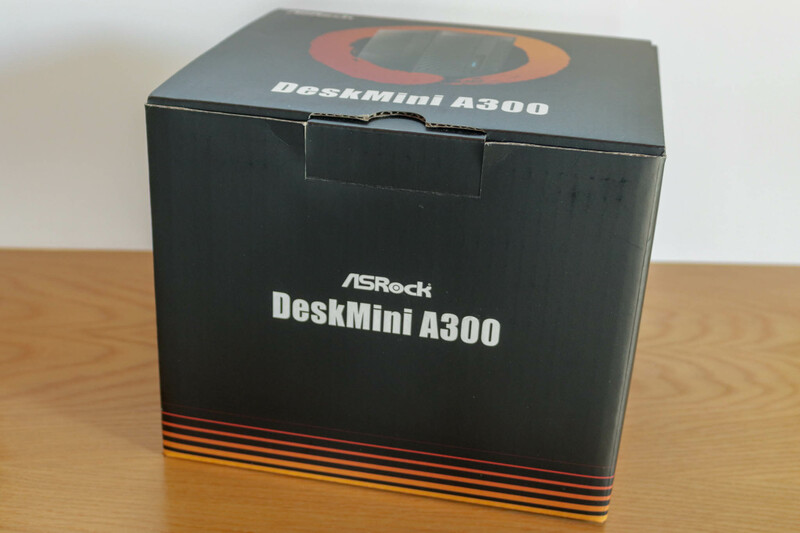 Consider an AM4 ITX board at around US$105, plus the cost of a chassis and power supply, the DeskMini A300 is not a bad deal. 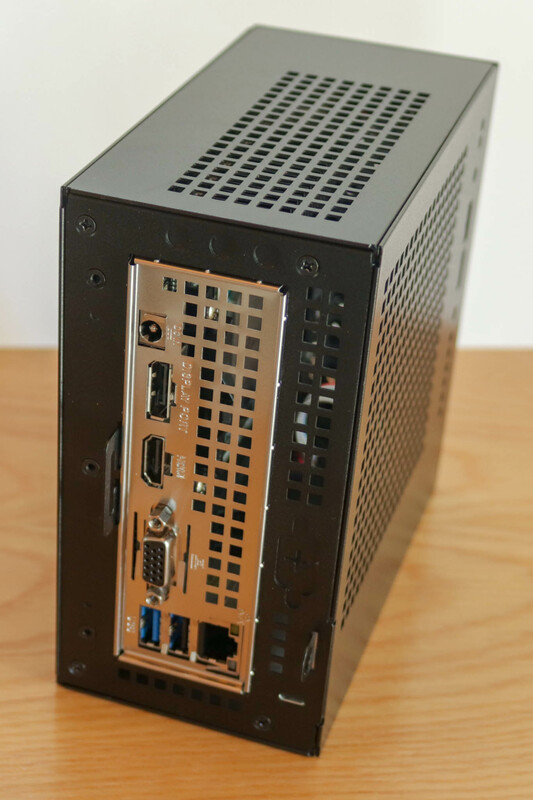 In saying that, I would like ASRock to offer a “Plus” model with an aluminium front panel, not unlike their MXM GPU versions – the DeskMini GTX/RX. I’d also like to see more vendors offering cases for the STX platform. Come on guys! The rear IO is modest, including DisplayPort (1.2), HDMI, VGA (honestly?! ), gigabit ethernet, and one each of a USB2.0 and USB3.1 Gen 1 port. The inclusion of VGA is understandable from a system integrator standpoint, with many corporate environments trying to hold on to hardware, such as monitors, for as long as possible. 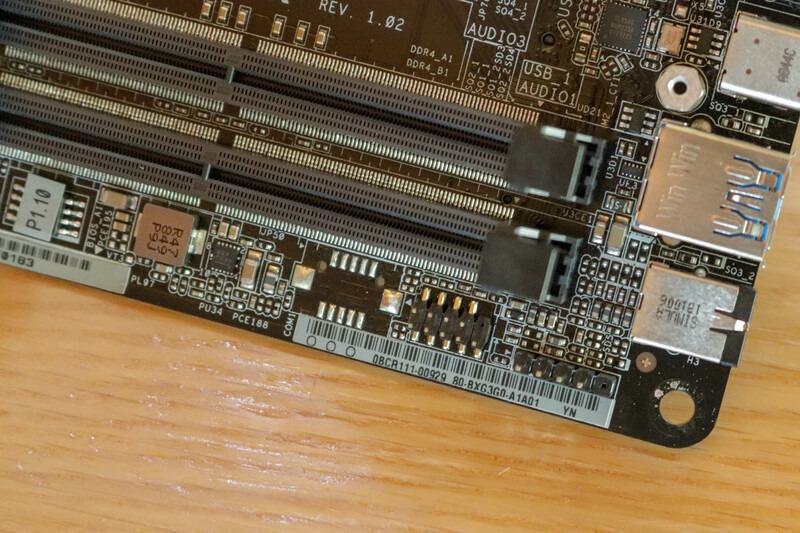 One of the limitations of the A300 platform is apparent on the rear I/O: only a handful of USB ports. 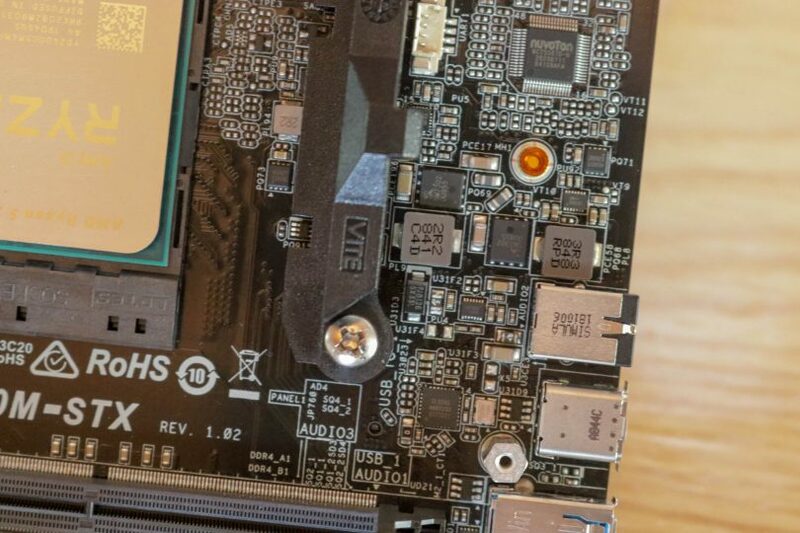 With only 4 USB3.1 Gen 1 ports available on the processor package, the three on the board already is close to the maximum, with the USB2.0 provided by a standalone USB hub chip that we will talk about later. 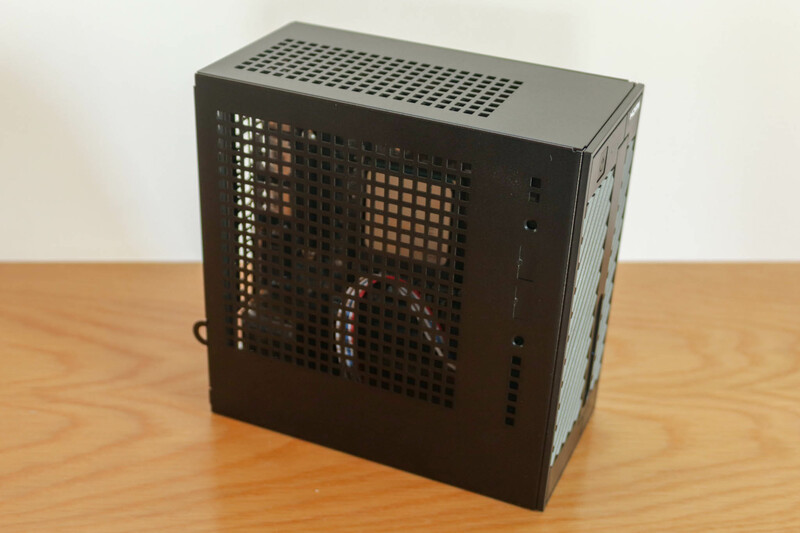 The chassis is very much designed for airflow, with many vent holes on the side and top panel. Also worthy of mention is the blanked off USB port location which I will take advantage of later. On the back side, the VESA mount is visible, using In-Win’s system, as per the previous DeskMini review. Let’s open the system up. As a barebones system, the DeskMini will come without any storage, RAM or processor. ASRock kindly supplied the Ryzen 5 2400G shown here. 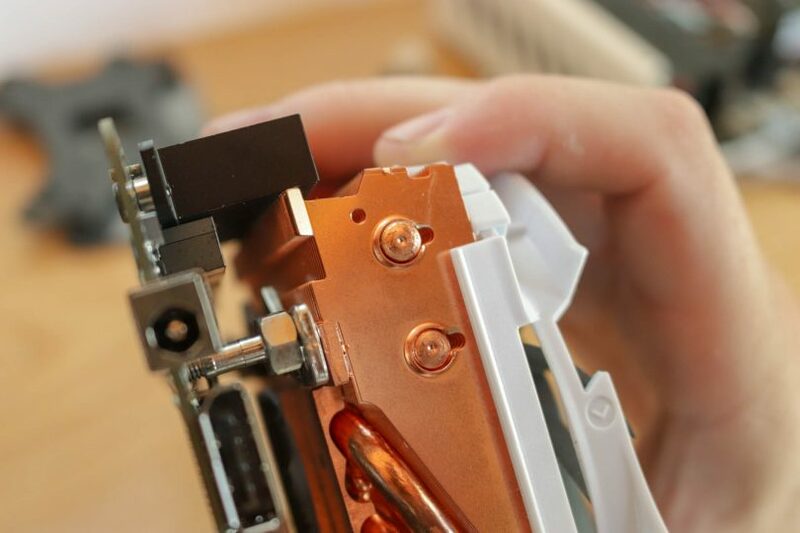 Removing four screws is all that is needed for the motherboard tray to slide out of the enclosure. Fully released, with only the front panel ribbon to disconnect. 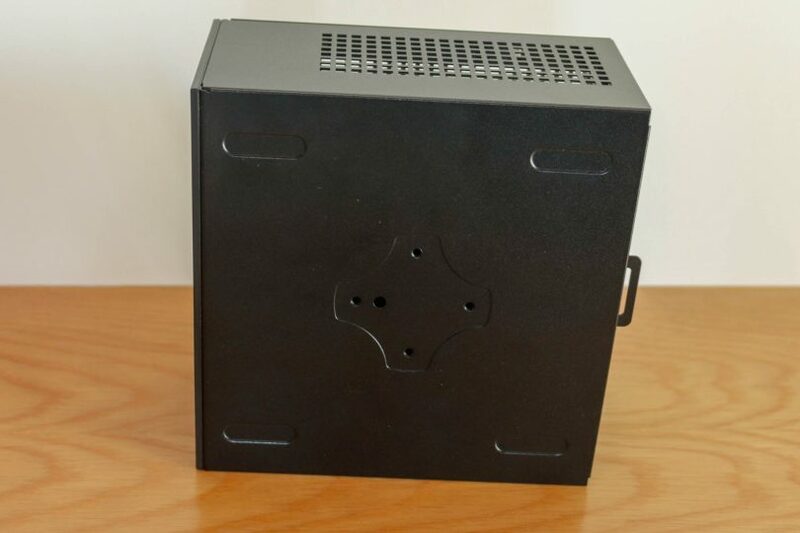 I’m still not a fan of this case design – sliding the system back into the shell is a pain if you have more than just the front panel ribbon installed. 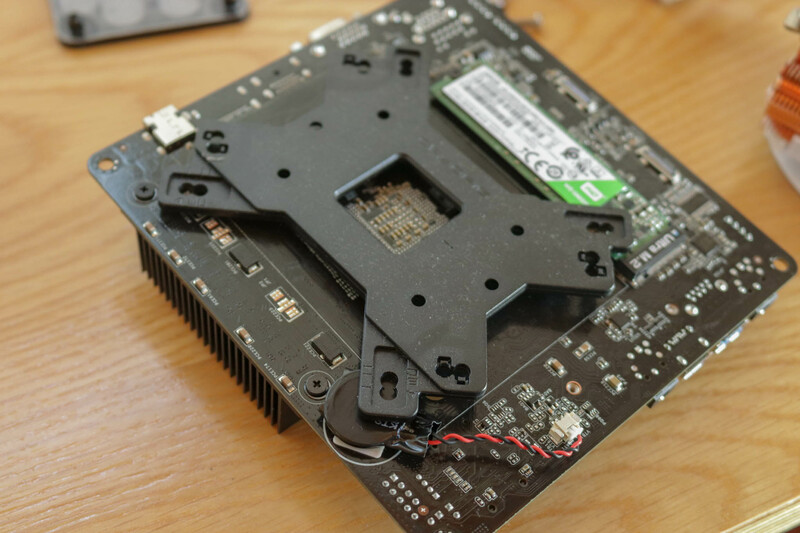 The motherboard tray looks the same as the the H310 model, but wow the motherboard is different. 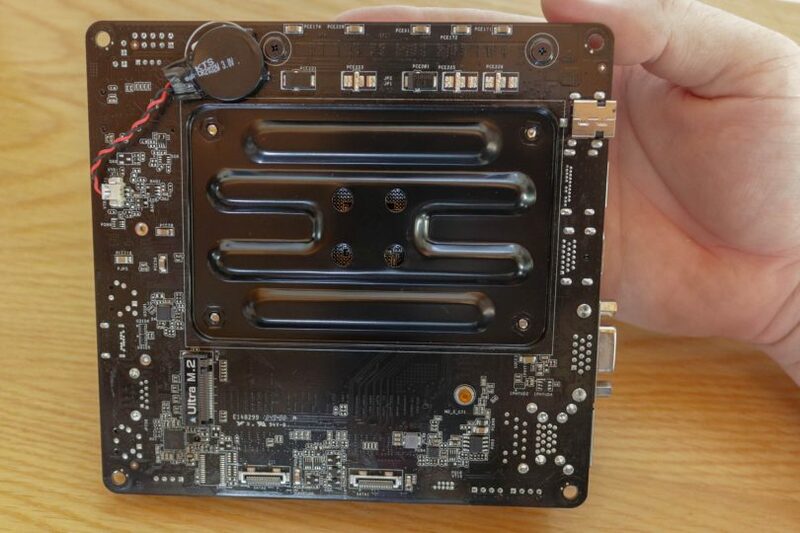 With impressive heatsinking of the VRM section, no chipset, and the very large AMD cooler mounting configuration, this is a sea change from the Intel based STX variants. 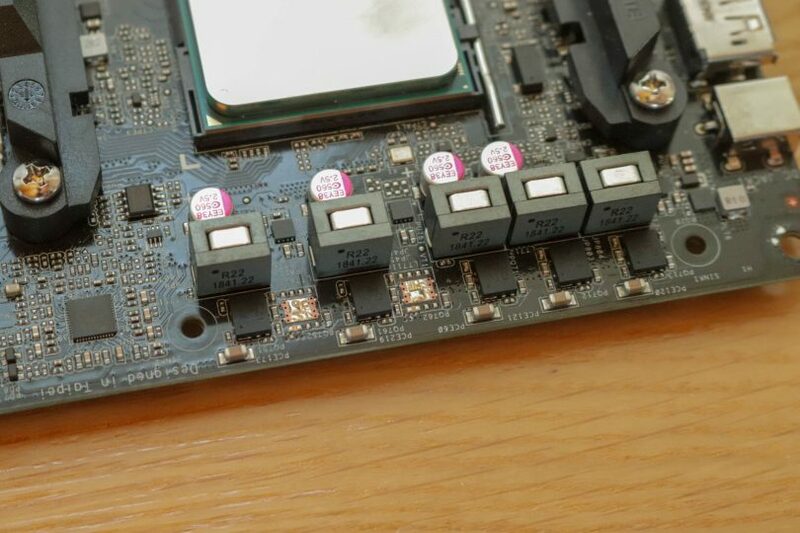 The AM4 socket is in the centre, with a pair of DDR4 SODIMM slots below. To the right, the standard STX form factor front I/O, embedded into the board, and to the top, the VRM section powering the CPU/GPU combination in the AMD APU. *Ryzen 5 2400G Vega 11 IGP – 129% performance gain over Intel UHD 630 (Coffee Lake IGP on i5/i7) as per UserBenchmark.org. Next to this, a speaker header, clear CMOS header and the USB2.0 front panel header. These are fed off of a USB2.0 hub chip, along with the rear panel USB2.0 port. 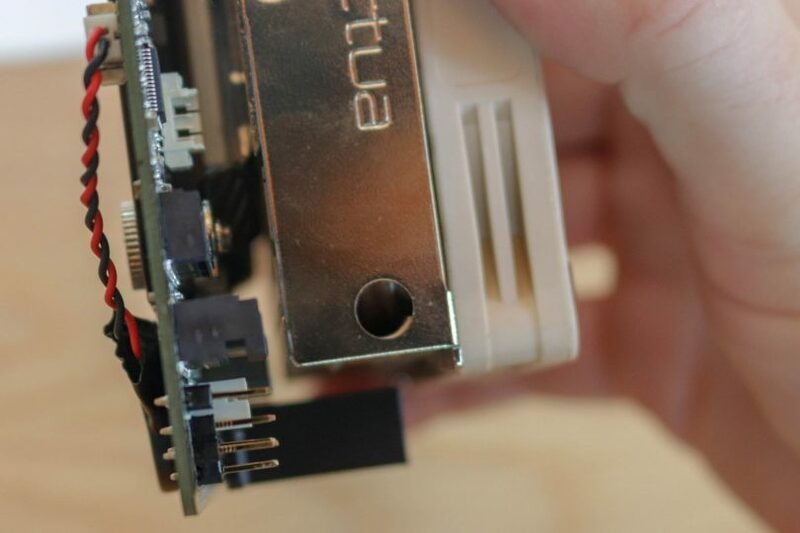 The chip hiding under the M.2 WiFi slot is a Nuvoton IO chip, supporting temperature sensors and other IO. 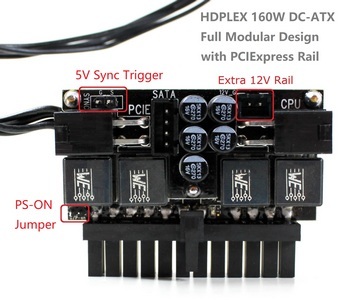 Between the headers and the VRM heatsink is a Richtek RT3667BB (PDF link) PWM controller chip, taking control of the VRM phases. 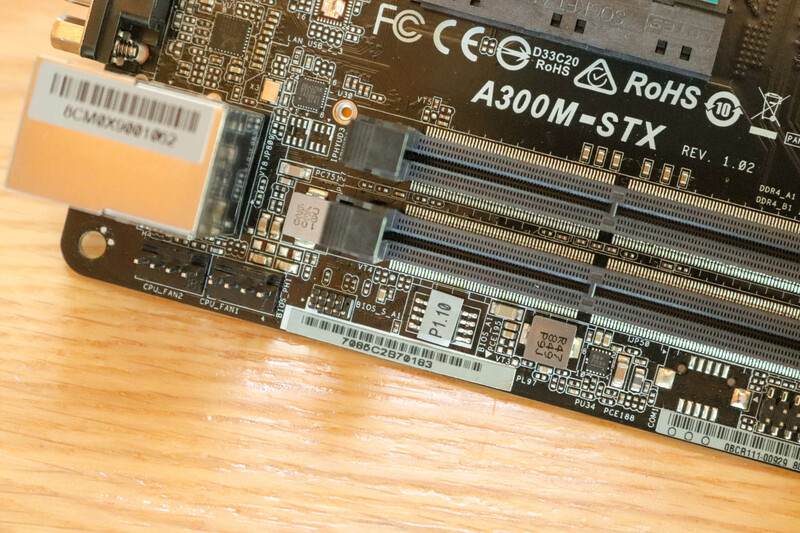 Down by the two DDR4 SODIMM slots, we find a pair of individually controllable CPU fan headers. The board is revision 1.02. 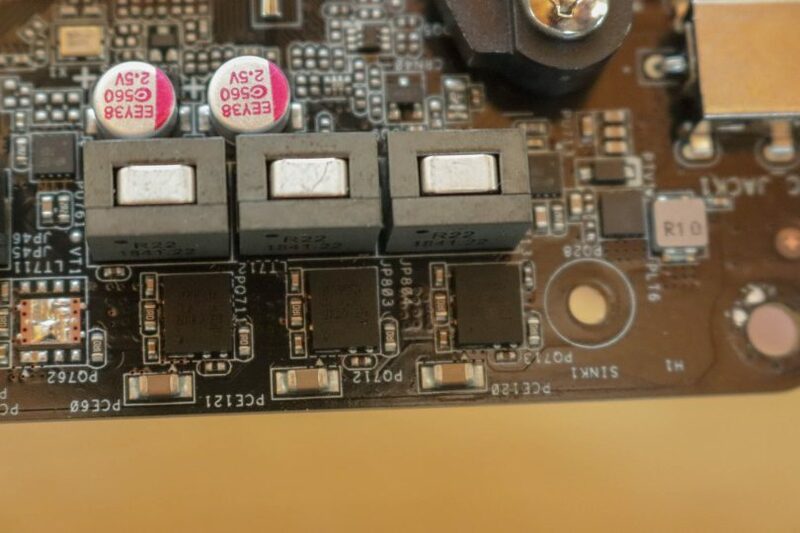 Nice work ASRock – it takes a lot of work to design a board from the ground up, and even more work to get it right so low in the revision number! At this corner, the front panel header, and an audio header for an headphone jack – see the manual for more info if this piques your interest. The little chip here marked USB_TC_1 is the USB2.0 hub, a Genesys Logic GL850G (PDF Link) model supporting 4 ports. Two of these go to the front panel header. 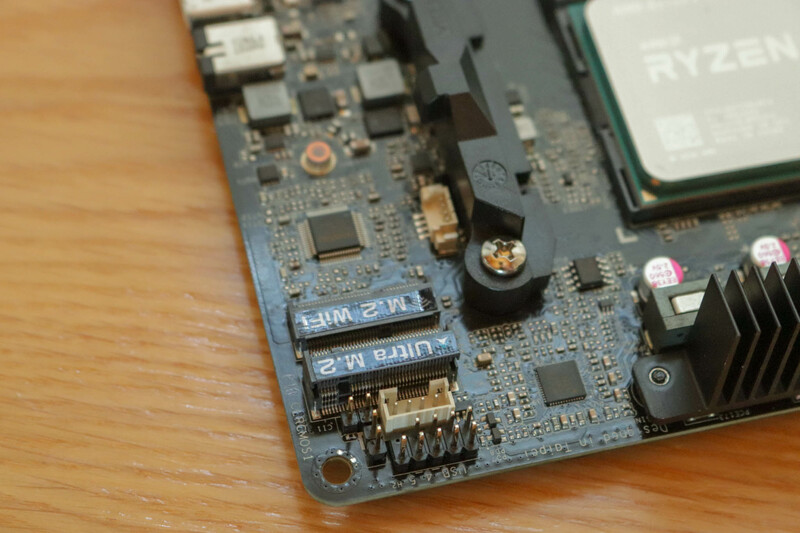 On the rear of the board, a giant AMD backplate, the CMOS battery, the twin SATA power/data plugs, another NVMe-only Ultra M.2 slot, and a bunch of supporting circuitry, including a Realtek ALC233 chip for the front audio. Underneath the front panel Type-C port is an ASMedia ASM1543 mux chip. Underneath the M.2 retention standoff is a Ricktek RT7272A (PDF link) 3 amp step down converter chip, most likely powering the 5v to the twin SATA ports. At the top of the board, the (correct me if I’m wrong please!) 3+2 VRM phases hide under the aforementioned heatsink. All MOSFETs in this are Texas Instrument CSD87350Q5D “NexFET”s. (PDF link) These chips can handle up to 40 amps each! The aforementioned NexFETs in detail. The board power limit is 65W, understandable with the limited VRM section shown here. At this time, we only have 65W or lower current generation APUs, however that may change next generation. Vega24 on an APU? Yes please. Don’t do this. I didn’t read the manual, and figured that this M.2 SATA SSD would work. Nope. 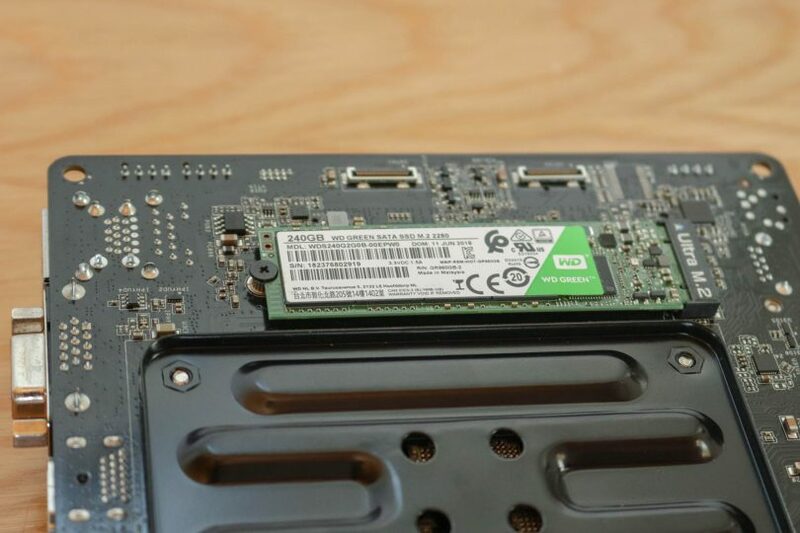 NVMe only need apply on this board – a shame. Using cheap M-SATA SSDs as a secondary drive would be ideal. First up, I thought I’d try the beautiful CRYORIG C7 CU. The backplate was a sign of things to come. This isn’t going to fit. Noctua time. Yep, this backplate fits! It does help that this is an AM4 only backplate, and doesn’t have ears on it to support Intel 115* like the CRYORIG unit. NH-L9a-AM4 installed. No conflicts, all is well. With the placement of the VRM heatsink, it was almost like it was designed for this cooler! Also installed – a pair of 8GB SODIMMs. I can’t find my matched pair so this will do for now. Both run at 2133 MHz no problem. Fan installed, cable hidden underneath the heatsink. This tiny touch in cable management makes for a very clean build. WiFi card installed from our DeskMini H310 review unit. May as well max this build out, given that we have the parts on hand. 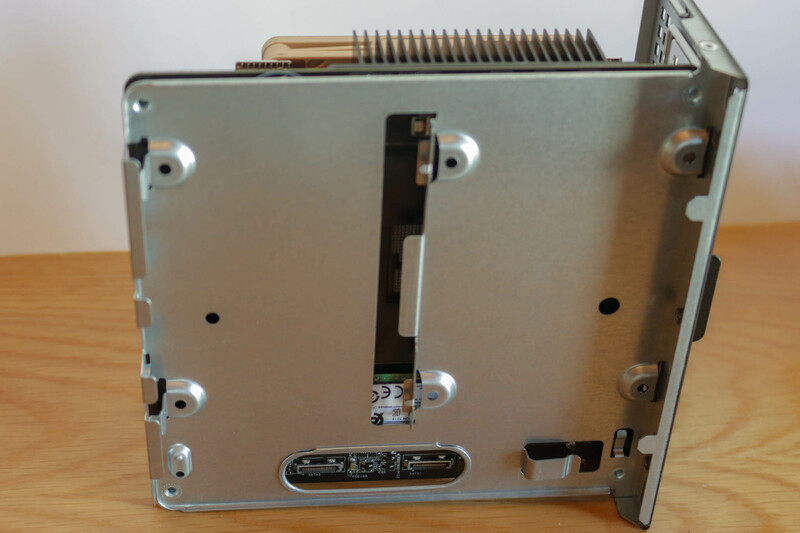 Underneath the motherboard tray, there is room for a pair of 2.5″ drives. Let’s fill those. Done. 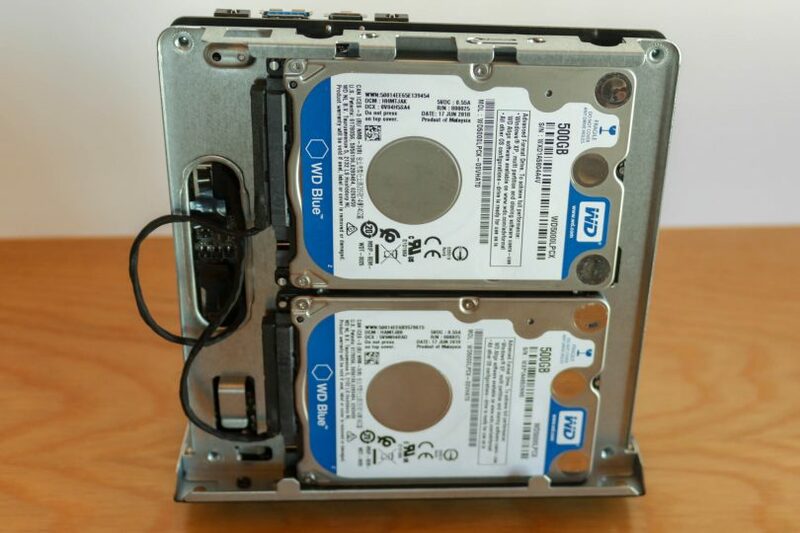 A pair of 500GB 2.5″ drives to run in RAID 1. Just for fun, of course. Any sane individual would use these spots for SSDs. Only one header is partially obscured, and that is the one for UART, which isn’t used in this system. You could fit a taller cooler in here, but at the risk of causing aural issues – having a fan right next to a side panel can cause all manner of turbulent airflow. Back in the chassis, looks good. I also installed the USB2.0 front panel unit from the H310 review unit again. Well, the testing will take a different angle from a normal review. When reviewing systems, we’d consider the combination of CPU and GPU, the balance, and thus the performance needed to be tested to compare this versus other systems. As a barebones, configuration of the system will be quite variable – all the way from the Athlon 200G (3.2 GHz, 2 cores, 4 threads, Vega 3 at 1 GHz with 192 shaders) to the Ryzen 5 2400G (3.6 GHz, 4 cores, 8 threads, Vega 11 at 1.25 GHz with 704 shaders) we have here. 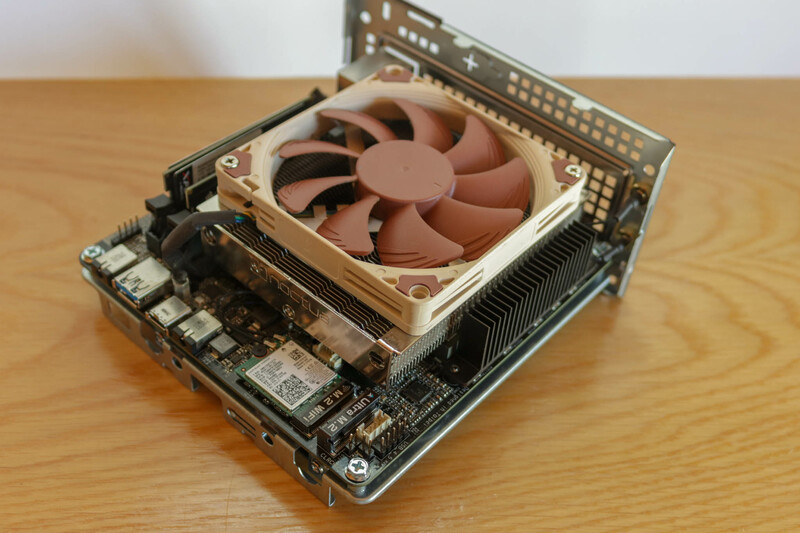 What we can do, though, is compare the system to a comparable Mini-ITX system – by installing the same APU into the board, and setting the DIMM speed (2400 MHz) to the same as the SODIMMs tested in the DeskMini. CPU cooler and storage drive are kept the same in each system. Also, in each configuration, the graphics was set to 3 GB of RAM available. I performed each test 5 times and averaged the results, throwing out any obvious outliers (of which there were none). During all testing, the CPU and GPU boost clocks stayed the same, regardless of platform. This isn’t as I expected- that’s a sizeable performance loss. I’m not sure as to exactly what is causing this, but it’s something I will have to investigate. 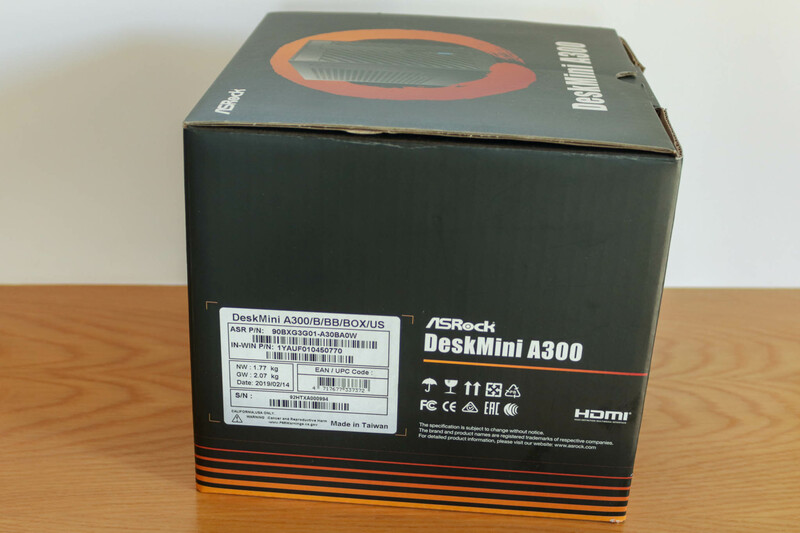 As a fan of the DeskMini line, I expected to love the DeskMini A300. Taking the uSFF form factor from the previous Intel based iterations but changing out the mediocre Intel IGP and core counts for the AMD Ryzen overkill core count and GPU. 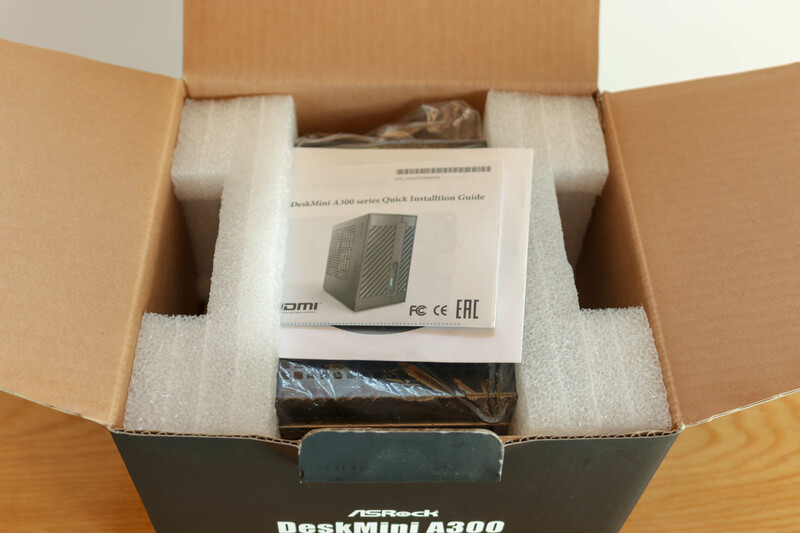 Whilst it wasn’t love, per se, it was a solid impressed feeling I walked away with – the DeskMini A300 is a great option for uSFF builds. 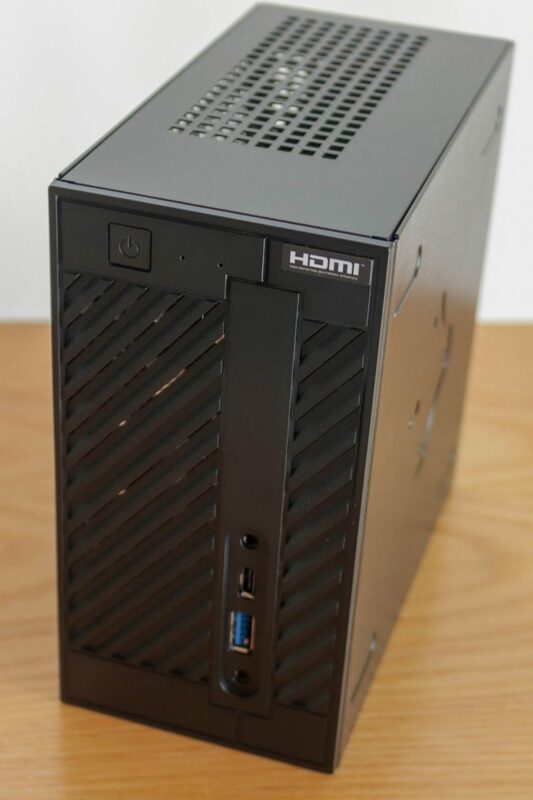 In all honesty, the DeskMini A300 makes the Intel based DeskMinis (not the GTX/RX ones, mind you), obsolete. With comparable CPU horsepower, much better graphics, and twice the M.2 NVMe slots, the value proposition is solid. There is also the option to build a really cheap system, with the low end Athlon 200GE still offering performance that Intel’s Celeron line (and even some of the Pentiums) cant match. At US$150 (NewEgg) at the time of writing, the system also offers good value for money in a barebones. Motherboard, case and power supply are provided (and cooler, but meh) for that price. Comparably, the current cheapest M-ITX AMD board on NewEgg is US$109. 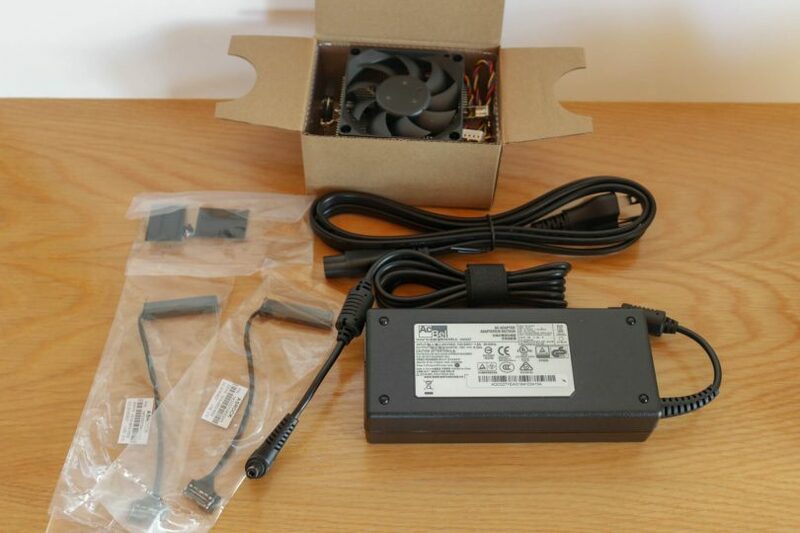 That leaves you US$41 for a case and power supply. Good luck! 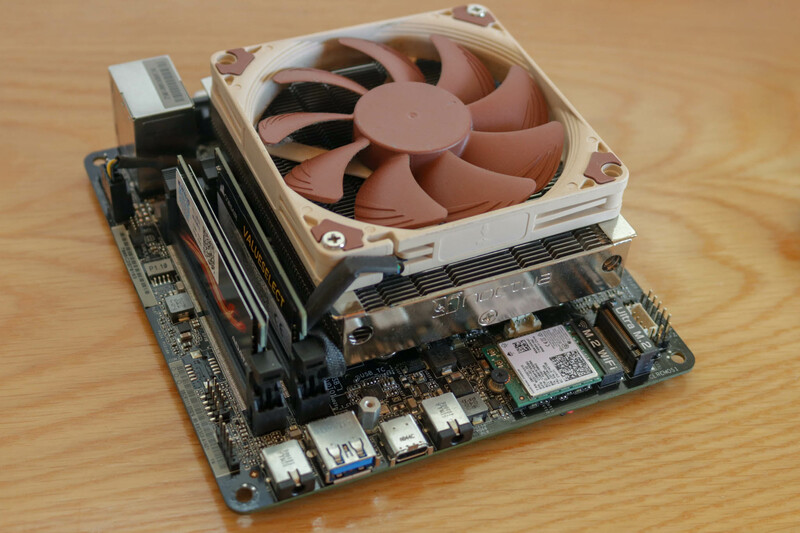 Whilst some would argue M-ITX offers expandability, the higher end AMD APUs offer some solid graphics horsepower. GTA V, 50FPS at 1080P? Sorted. However, I was perplexed by the performance decrease in the benchmarking performed. Whilst the stats reflected the same clocks, timings and boosts, the performance did not. I’ll have to do some performance analysis here – something’s going on. 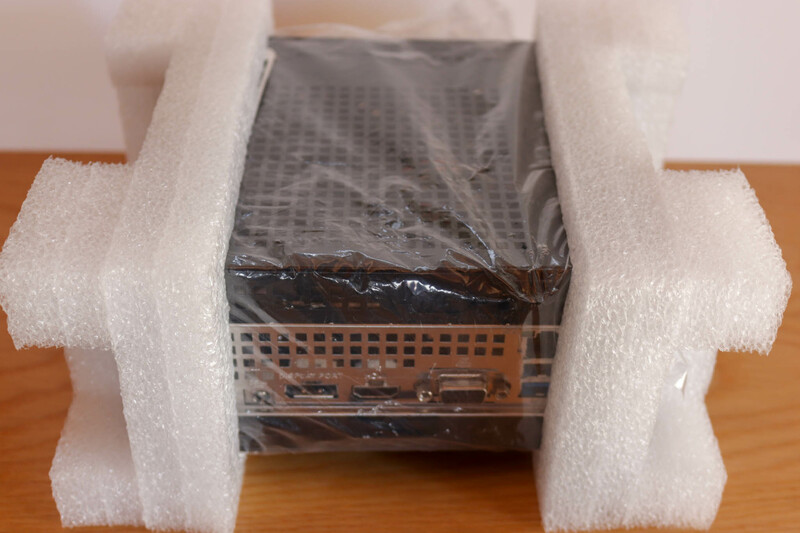 I’d also like to see a higher quality chassis for the DeskMini line – even if they come with a slight cost increase. 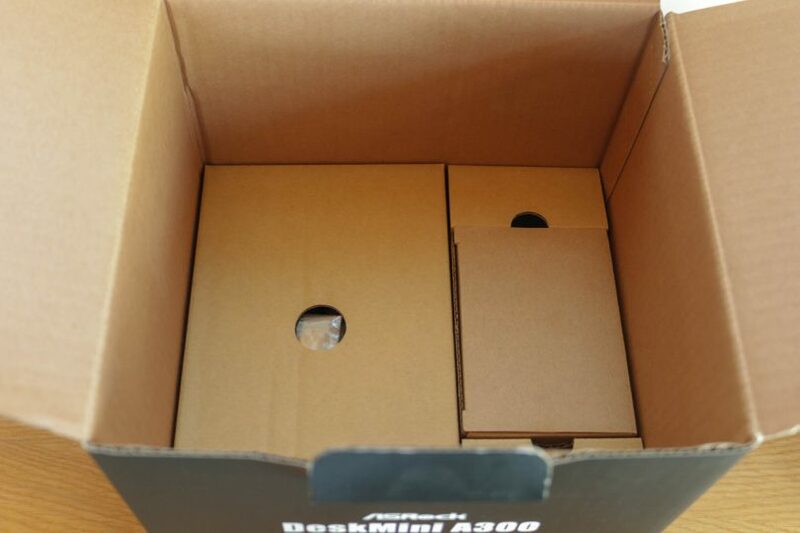 Keep an eye out in the next month or two for reviews of alternate cases for the DeskMini line! Some performance loss? I’ll have to keep digging!